Brandon, MB – While it is certainly more of a winter wonderland than a golfer’s paradise right now at the Wheat City Golf Course and Recreation Centre, the City of Brandon is pleased to provide the public with an update on important infrastructure enhancements made at Brandon’s only 18-hole course in advance of the 2017 golfing season. 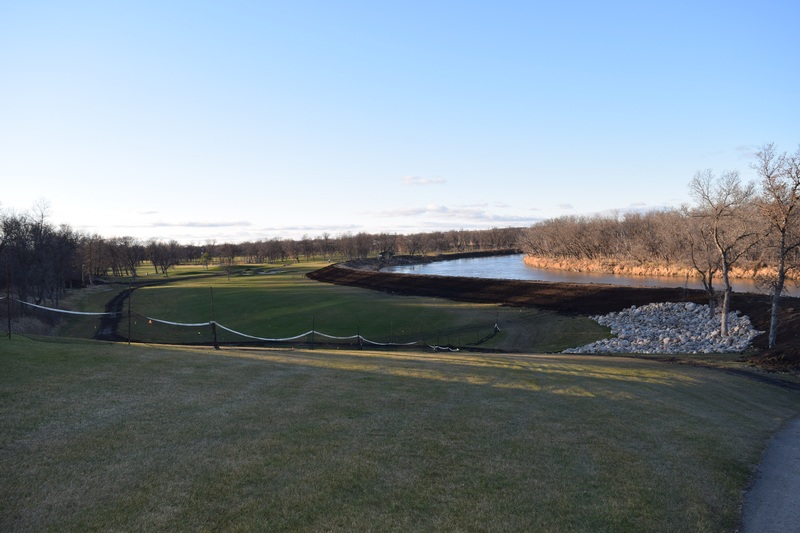 Significant earthwork was conducted prior to the onset of winter along the course’s Assiniboine River embankment to ensure the lower portion of the golf course (a total of 12 fairways and 11 greens) is protected against potential future river flooding. Work will re-commence in the spring to complete this construction, after which the course’s main embankment will sit at an elevation capable of protecting the course from a river level equal to that of 2014’s historic summer flooding event. The construction project also included creating new elevations for tee boxes on the course’s 3rd and 5th holes, and drainage improvements on its 4th and 7th holes. This work was conducted over several weeks last fall by City of Brandon Operational Services Division staff in assistance with E.F. Moon Construction. The Wheat City Golf Course embankment project was approved by Brandon City Council in June of 2016, at which time Council voted to fund the cost of the project from within the proceeds of the subsequent sale of the existing Recreation Centre building and its parking lot to a private developer. Wilson adds that due to the presence of heavy machinery on the course during last fall’s work, the embankment on Holes 1, 3 and 4 needed to be sloped and winter-seeded prior to the snowfall, while Holes 2 and 7 will have this work completed as soon as spring allows. Other enhancements at the course include the development of a new cart path along the course’s 1st Hole. Complete information on services & amenities offered at the Wheat City Golf Course & Recreation Centre can be found at www.wheatcitygolfcourse.ca.